The weather has cooled down in Utah so I’ve officially starting wearing boots and booties! I posted this outfit on Instagram a few days ago and I had SO many questions about my booties! They are from a brand called M.Gemi that I first discovered randomly on Instagram. I was scrolling through the explore page and spotted a pair of hot pink pointy flats that I had to have! I clicked on the picture and stumbled onto M.Gemi’s Instagram page where I ended up ordering the pink flats because I was so obsessed with them (you all know I’m a sucker for pink). Shortly after they reached out to team up to share with all of you more about their brand and the gorgeous styles they sell. I love how M.Gemi works their brand. Their shoes are all handmade one at a time in small workshops throughout Italy so the quality is incredible and super luxurious! I love that they try to embody the Italian lifestyle in everything they do. And I love checking their website at the beginning of the week because they release new styles in small batches every Monday! They are totally ahead of the trends and I can’t wait to see what styles they come out with next. Loved the boots & ur top too… would sure check out the M.M.Gemi page..
Beautiful fall outfit. Love your booties! Such gorgeous booties! Thanks for sharing! Love this simple & classy look! The booties will go with so many outfits! Great casual outfit! Love the hat! This bag is so lovely! Yes to the boots and olive hat!! Great styling as always Rachel! Thanks for sharing these booties, they are so cute. I’m still waiting for that cool air to swoop down and hit Florida! Hope you have a fabulous Friday and weekend! Those are such nice booties! Love their color! The hat is also so pretty! Love the boots and just the simplicity of the outfit! So pretty! This is such a great fall go to look! I like your boots and bag very much! You’re looking great girl! Love those booties! They look great with that denim too. such a beautiful Prada bag, best part of this look. Obsessed with this look! So simple and chic. Loving the color of those booties! So pretty… and the high waisted denim is perfect for an easy casual weekend look! This is such a cute look! Love the combination of denim and your booties! Hats look so great on you! I love the color of this one. Great outfit! Love the booties and that hat. So happy to see booties and hats again. Loving this look! So cute! I love that hat on you! I love the Prada with the Rag and Bone hat… It just goes to show that the Prada bag is perfect for classy AND chic looks! I like how you are branching out your look! I love a great simple outfit that is put together with perfection. The accessories take it from simple to amazing. Love the boots. Very feminine boots, they strech your legs and I think that is the nice thing about it!!! My first thought when I looked at these pics was about the booties! They are adorable. Love this outfit! Those boots are amazing and I love the higher waisted jeans. So simple, yet chic! I’m sold on the booties! The booties are gorgeous and love their dark camel shade! M.Gemi sounds like a great brand, thanks for sharing! Thanks for sharing this brand with us, Rach, I’ll have to check them out! I love these booties and the way you styled them, that hat was a nice touch! I hope you have an amazing day and weekend, beauty! You look so cute – perfect outfit for the Fall! Love that Dasher is in the pic too. I love this outfit! Your jeans and those boots are an amazing combination! I can see why you fell in love with this brand! Those booties gorgeous!!! Omg, those boots + that hat = perfection. Love this look. I’m still obsessed with the pink flats you have! Love these booties, but I especially love the rise of these jeans…they are exactly what I’ve been looking for! I love when Dasher makes an appearance! Love your outfit..it’s perfect for fall! Everything about this outfit is perfect! It’s casual yet sophisticated, dressy, but laid back, it’s perfect. I will definitely be checking out M.Gemi’s collection! I just got the same hat in navy from Intermix! It is so flattering. Just love it. Will be on my blog sometime in the next 2 wks. Love your style and glad you are representing all the lady entrepreneurs out there nicely! Love love love these booties…the perfect heel and the perfect toe! These booties are so perfect! I love the style, the heel and the color. I love that top! Gorgeous! Those booties are the perfect height! LOVE these boots! I’ve been on the hunt for some brown suede and these are perfections! loving this look head to toe! I love the color of your hat, great style! These booties are amazing! Thanks for recommending them. You look amazing! love those booties. those boots are so great for fall! Love M Gemi! Such a great shoe brand. Super gorgeous. I love those booties! I love the color of your bag, just can’t imagine spending $2700 on a hand bag, yikes! Perfect shade of pink though. Sorry, but those are totally mom jeans. 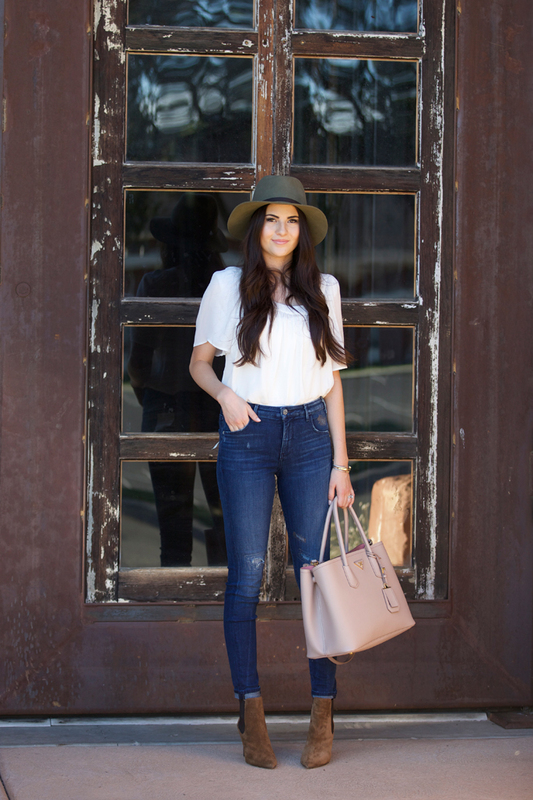 Love those high waisted jeans and the hat! Great outfit! Such a cool story about the show company! Love the hat too, Rach!